And when i click on : Click to see installation guide, no guide available. Do you have help for me? Is like to install this in blind. just by the way: I know he has no harness for kia but it would be great to support it in the future for a rio 2013. Thanks! I will give the guide to my installer. Just to be sure, the streering wheel controls, the gauges and OBD2 (check the engine codes) is what will work on the car for now right! 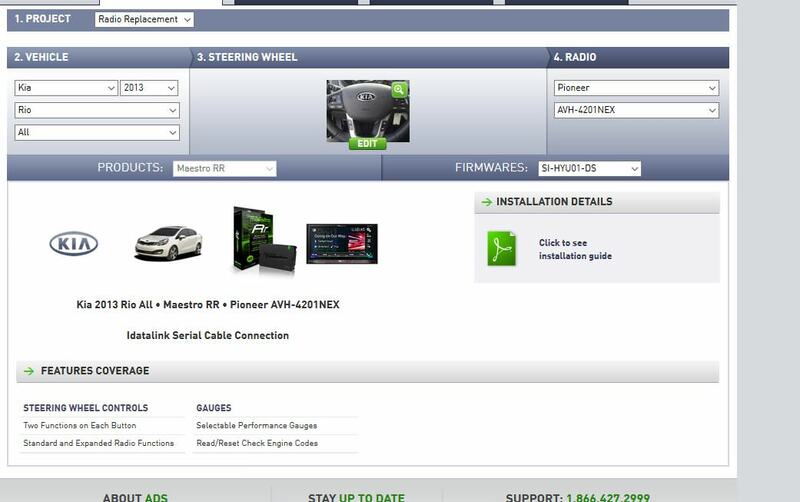 Is planning more options in the future for my car ? Last question, i have the metra wiring Harness in the car ( to avoid the cut of the original wires when connecting the radio. ) The wires of the maestro need to be connected directly to originals wires or in metra harness will work too ? what you suggest? Generally, the metra harness will not have steering wheel wires populated, so we recommend splicing directly to the steering wheel wires in the car. Thanks! I will give this to my installer guys when i will be ready. 1 - The config of Steering wheel controls when flash.. about The track up and down in default he is: ( press once ( Seek ) and press and old is on: preset ) On the FM radio of my radio I have favorites and i need to press and hold to have my favorites. On bluetooth mode or on android auto I only need to press to change my music. So I tried to reverse them .. on the radio mode fm I just press and my favorites change. But on bluetooth mode for my music.. the buttons is not working at all i mean press one or hold on is make nothing. I put them back by default. Why That ? I guess it's a maestro bug ? 2 - I add the gauges: gas mileage in real time. (I already have them on the dashboard of the car. I enter the requested values: minimum 2 liters, and maximum it is 70 liters by default. I press the key to go down like the others and it does not go down that one .. it returns to 100 liters. how to fix that ? is a maestro bug or a pioneer bug ? Or we can not take it down this one? When I drive the gas mileage in real time, it displays correctly on the radio. 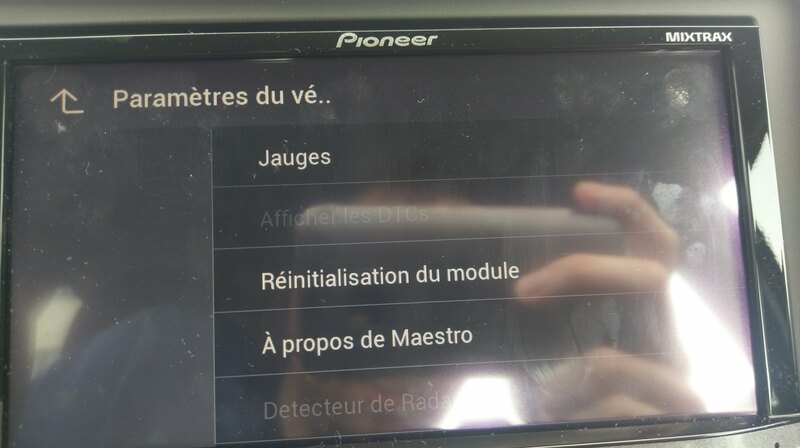 3 - How can i read the OBD2 (check the engine codes) on the radio when i will get one ? 1- It's likely a radio bug. We don't know and don't care what source you're in. We just see that you pressed seek up, and we send the command that you programmed for that button. 2-If the fuel mileage is displaying correctly, there is no need to adjust the tank capacity. Otherwise, please send us a video to maestro.support@idatalink.com and I can have the engineer take a look at what you're describing. 3- Go to the OEM Setup of the radio. The check engine light info will be under the gauges section. 1 - I have flashing three times and is the same thing with the defaut config all press work but when i reverse it is do not work properly. 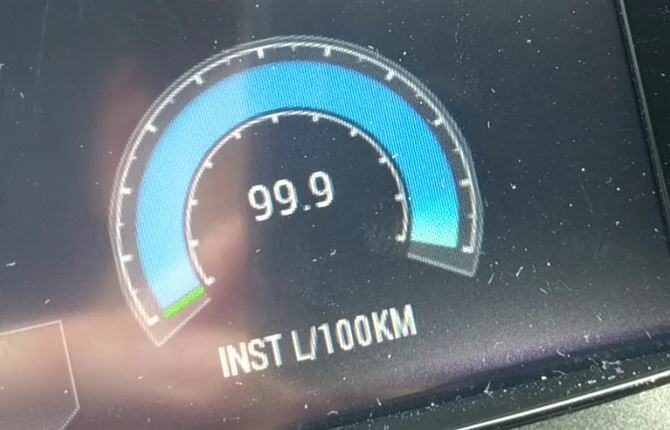 2 - The display is look fine when I run but when I'm not running why is it full at 99.9 L ? at compared others gauges. little picture : . I have send a video in your email with the bug of the tank capacity of this gauges and you will see full too. 3 - I am in the OEM Setup i have this: I guess is display DTCs but is grey why ? 1- I do not understand what you are asking. Are you talking about the steering wheel controls? We have nothing to do with reverse in this car. If something stops working in reverse, it is likely that the radio is coded to ignore the commands. Even my car, from factory, ignores steering wheel controls when I am in reverse. 2-I do not understand. When you say run, do you mean drive, or when the engine is running? 3-Display DTCs is gray because you don't have an alert right now. It will light up when you get a check engine light. 1 I do not talking about the reverse transmission but when i reverse the control in the config. I mean when i want to flash my maestro rr in the website. I have made a pictures: This is the config in default : and when i reserve this two here like this: (I prefer to press than hold for my favorites in the radio ) Noted that in the bluetooth mode I just press with the config default. So with the new config The radio favorites now work fine just press but when i am in bluetooth mode my music do not change at all. I press nothing the maestro do nothing but when i press and hold i have a beep and the maestro respond but nothing happening. I am sorry for the misunderstanding, i am talking french is still have problem with the english, yes i know you have a section of french but is look pretty dead i am waiting to have much help here. 2 When i say run i mean driving, when i am driving the gauge counter is working properly. But when i am not driving the counter is full like this: Why that ? Why does not he become at 0 like the others? I send you a video with the bug of tank of this gauges have you see it ? 3 - Okay Its make more sense now. 1- The bluetooth source is going to operate differently than the FM, but that is the radio manufacturer's design. We cannot control how that is coded. 2- That is correct. Instantaneous MPG will read when you're moving. Otherwise you would technically be getting 0 MPG. If you want a consistent reading, use Average MPG. Ok i will add Average MPG. Last question for you some gauges is not available for adding. I mean is grey i cannot add it. Is normal? if you want what gauges , i can give you later. If a gauge is grayed out, it means it is not an available gauge for your vehicle. The information is not present on the databus.